BY DATING THE OLDEST ROCKS ON EARTH GEOLOGISTS ESTIMATE THAT THE EARTH FORMED AROUND 4.6 BILLION YEARS AGO. When we talk about geological time this is our starting point. Since 4.6 billion years is an insanely long time, we divide up Earth’s history into smaller and distinct units. THE LARGEST UNIT OF GEOLOGIC TIME IS AN EON. EACH EON BREAKS DOWN INTO SMALLER SECTIONS OF GEOLOGIC TIME CALLED ERAS. ERAS BREAK DOWN INTO SMALLER CHUNKS CALLED PERIODS. PERIODS ARE THE UNIT OF GEOLOGIC TIME THAT WE WILL USE MOST OF THE TIME. THE DIVISION BETWEEN ONE PERIOD IN THE NEXT IS BASED ON FOSSIL EVIDENCE. WHEN AN EXTINCTION OCCURS, OR WHEN A NEW TYPE OF LIFE FIRST APPEARS WE MAKE A NEW PERIOD. THE SMALLEST PIECES OF GEOLOGIC TIME ARE CALLED EPOCHS. FOR MOST PERIODS, THE EPOCH IS JUST USED TO DESCRIBE THE EARLY, MIDDLE, OR LATE PART OF THE PERIOD. THE GEOLOGIC TIMETABLE IS ORGANIZED SO THAT THE OLDEST THINGS ARE AT THE BOTTOM, AND THE MOST RECENT THINGS ARE AT THE TOP. To the right side of the Epoch column you will notice a bunch of numbers. THESE NUMBERS TELL US HOW MANY MILLIONS OF YERAS AGO SOMETHING OCCURRED. We can use them to figure out when different Periods and Eras began and ended, and when different mass extinctions occurred. For Example: How long ago did the Permian Period End? For example: During which period did the earliest birds appear? To find the answer we simply skim the Life on Earth column until we find the Earliest Birds. Then we follow that row across to the left to find the period we are in...Jurassic Period. The following column shows us the lifespans of several different groups of organisms who once lived in New York State. Their fossils can still be found in rocks that formed when they were alive. 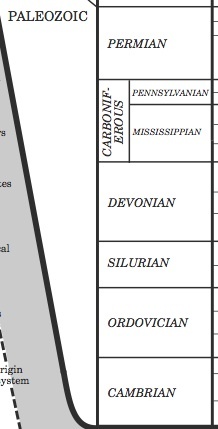 The important fossils are labeled across the bottom of pages 8 and 9. They are represented by letters A - Z, with each letter standing for a different fossil organism. In the Time Distribution of Fossils column each of these letters is embedded in a vertical stripe. The stripe the letter is in tells us the group of organisms the fossil belonged to. The stripe goes through every period that the group lived during. The letter itself is found in only one period. This is the only period during which that particular fossil lived. For example: To which group of organisms did the fossil Eurypterus belong? During which period did Eurypterus live? Finally we look to the left to find the period during which Eurypterus lived...Silurian Period. 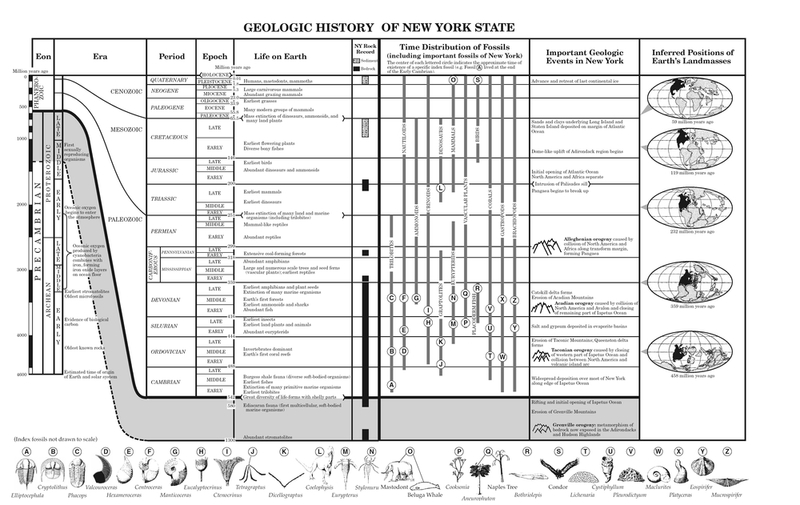 The final column we need to be concerned about is the Important Geologic Events in NY column. This one works in the exact same way as the Life on Earth Column. We can use it to answer questions regarding when certain geologic events happened. For example: During which period did the initial opening of the Atlantic Ocean occur? To find this we simply scan the Important Geologic Events column until we find the relevant info, then follow the row straight across to the left to find the period...Jurassic Period.